A massive ransomware campaign appears to have infected a number of organisations around the world. Screenshots of a well known program that locks computers and demands a payment in Bitcoin have been shared online by parties claiming to be affected. There have been reports of infections in the UK, US, China, Russia, Spain, Italy, Vietnam, Taiwan and others. Security researchers are linking the incidents together. One cyber-security researcher tweeted that he had detected 36,000 instances of the ransomware, called WannaCry and variants of that name. “This is huge,” he said. Another, at cyber-security firm Kaspersky, said that the ransomware had been spotted cropping up in 74 countries and that the number was still growing. 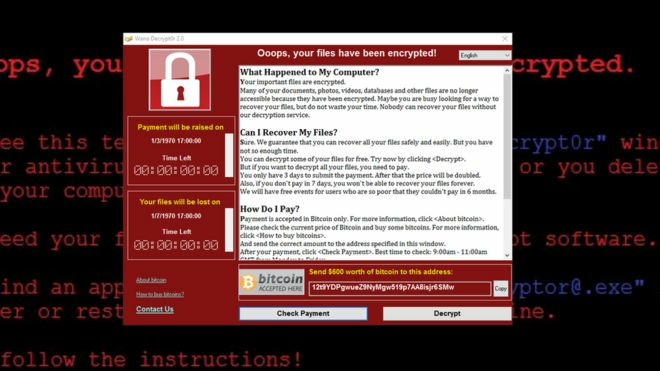 The UK’s National Health Service (NHS) was also hit by a ransomware outbreak on the same day and screenshots of the WannaCry program were shared by NHS staff. A number of Spanish firms were among the apparent victims elsewhere in Europe. Telecoms giant Telefonica said in a statement that it was aware of a “cybersecurity incident” but that clients and services had not been affected. Power firm Iberdrola and utility provider Gas Natural were also reported to have suffered from the outbreak. There were reports that staff at the firms were told to turn off their computers. Screenshots of WannaCry with text in Spanish were also shared online. In Italy, one user shared images appearing to show a university computer lab with machines locked by the same program. Bitcoin wallets seemingly associated with the ransomware were reported to have already started filling up with cash. Another firm that confirmed it had been caught out was delivery company FedEx. “Like many other companies, FedEx is experiencing interference with some of our Windows-based systems caused by malware,” it said in a statement. “This is a major cyber attack, impacting organisations across Europe at a scale I’ve never seen before,” said security architect Kevin Beaumont. According to security firm Check Point, the version of the ransomware that appeared today is a new variant. “Even so, it’s spreading fast,” said Aatish Pattni, head of threat prevention for northern Europe. Several experts monitoring the situation have linked the infections to vulnerabilities released by a group known as The Shadow Brokers, which recently claimed to have dumped hacking tools stolen from the NSA. Some security researchers have pointed out that the infections seem to be deployed via a worm – a program that spreads by itself between computers. For more information on how to protect yourself and your company click here.